KSB has recently extended its portfolio of submersible borehole pumps with a range of new sizes for particularly high heads. The new pumps have a diameter of up to 50 in (1250 mm) and a drive rating of up to 5 MW. These are capable of handling flow rates of up to 5000 m³ per hour at heads of up to 1500 m.
Submersible borehole pumps have a longer service life and their wet motors are not compromised by flooding. KSB offers double-entry designs for particularly high load conditions as well as single-entry designs. The double-entry design was originally used for drainage applications in mines. 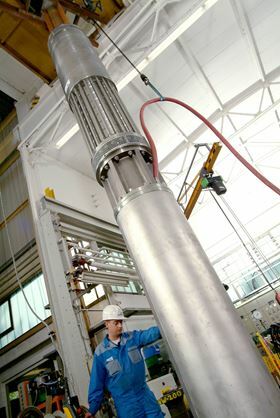 The heads required in these applications would have created very high axial thrusts in single-entry pump designs, placing extremely high loads on the bearings. The back-to-back impeller arrangement employed in double-entry designs reduces the axial thrust and the associated bearing loads. The recent growth of such projects has led to increased demand for higher volume flow rates and the resulting need for larger pump sizes. The demand for higher pump outputs is occurring in the mining industry and in water supply, cavern and offshore applications. B pumps have a submerged hydraulic system. New impeller can be used with a number of Movitec variants.